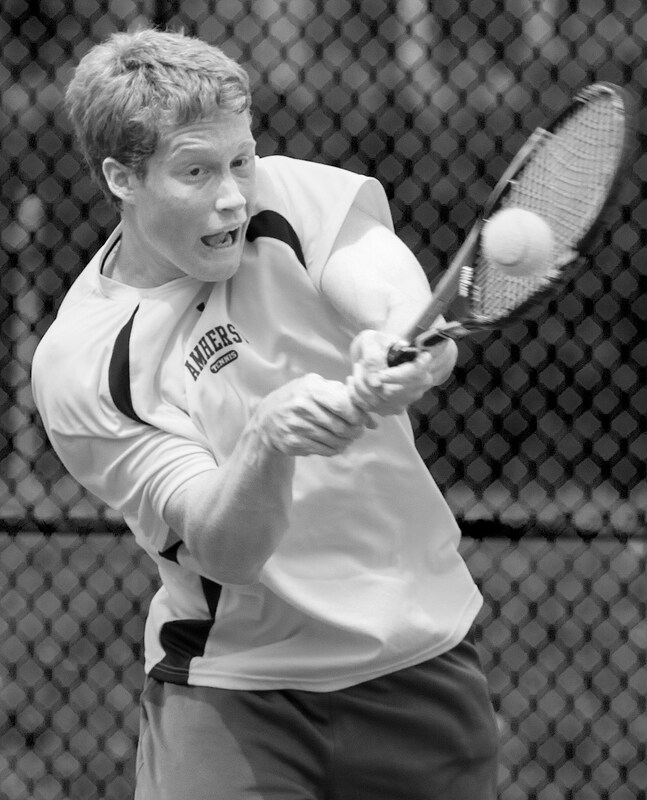 Joey Fritz ’14 earned All-American status for his singles play last year. The team continued its strong play throughout the spring, compiling an impressive record of 27-2 heading into the NESCAC tournament. With a perfect 8-0 conference record, Amherst earned the NESCAC’s top seed and defeated Bowdoin for the NESCAC title. The Jeffs cruised through Nichols and Vassar in the early rounds of the NCAA tourney until they fell to an upstart Washington-St. Louis squad, 5-3. Despite the loss, Amherst still finished with an impressive 31-3 record. The program also made history as Luis Rattenhuber ’12 and Austin Chafetz ’12 went on to win the NCAA doubles tournament, making them the first doubles champs in Amherst men’s tennis history. The dominating duo defeated Carnegie Mellon, Cal Lutheran and Johns Hopkins, before coming back against a strong Gustavus Adolphus doubles team to win the title in three sets. That said, getting there will be tough, as the program is losing starters Chafetz, Rattenhuber, Wes Waterman ’12 and Andrew Jung ’13. Also graduating are seniors Robby Sorrel, Julian Camacho, Sam Sperling and Chris Morrison. The team is returning many top players, including Mark Kahan ’13, Surain Asokaraj ’13, Joey Fritz ’14, Dale ’14, Eli Mlaver ’14, Justin Reindel ’14 and Jon Cypers ’15. First-Years fighting for spots include Birk Mitau, Andrew Yaraghi, Aaron Revzin, Philip Qu, Carlos DeBracamonte, Russell Einbinder, Ben Fife and Michael Solimano. The Jeffs look prepared for a strong fall and will be lead by senior co-captains Kahan, Asokaraj, Matt Lerner ’13, Will Rives ’13, and Daniel Keolasy ’13. The fall season begins with ITA Regionals at Williams from Sept. 28-30. The Jeffs then square off with Johns Hopkins on Oct. sixth and Carnegie Mellon Oct. seventh. Amherst will finish its fall season with matches against MIT and Wesleyan the weekend of Oct. 12-13. Head Coach Chris Garner hopes the program provides students “an opportunity to have a great athletic experience this fall.” Despite losing a lot of talent, this year’s strong incoming class, combined with key returning players, should certainly help pave the way for a successful fall. Entering the 2011-2012 season ranked No. 2 in the country, women’s tennis started off somewhat slowly, going 8-3 in its first 11 matches. The team found its stride in the spring, rattling off an impressive winning streak including two strong victories over rival Middlebury. Amherst would go on to upset then-top-ranked Williams in the NESCAC championships, 5-2, and secure a berth in the NCAA tournament. The team cruised through their first two opponents in NCAAs, sweeping SUNY Geneseo and Skidmore College. Amherst then faced a strong Carnegie Mellon squad in the quarterfinals, but Caroline Richman ’13 broke through a 4-4 tie and secured the win. The Lady Jeffs fell short of a second consecutive appearance in the final four, dropping a 5-1 decision to the University of Chicago in the NCAA semifinals. Still, the team compiled a solid 18-5 mark, including 6-1 in the NESCAC. Amherst also ended on a high note in doubles, as Laura Danzig ’12 and Gabby Devlin ’14 roared back against Emory to win the Division III women’s doubles tournament in three sets. Their victory gives the women’s tennis program four doubles crowns, which is good for the second most in Division III history. Amherst enters the fall having lost one of its best players last year in Laura Danzig. Danzig will graduate fresh off an NCAA doubles title and as a three-year All-American in singles and doubles. The program also loses seniors Kim Snyder and Ashley McCall. However, the Jeffs still look primed for another impressive season, bringing back Devlin, the other half of the championship doubles team, as well as other top players including Richman ’13, Jordan Brewer ’14, Jennifer Newman ’14, Zoe Pangalos ’14 and Safaa Aly ’15. Brewer, who had appendicitis before last year’s NESCACs and still took home the national doubles title, should be primed for another impressive season. Though losing three seniors, the squad anticipates the addition of five first-years, Suhasini Ghosh, Lara Min, Sarah Monteagudo, Rebecca Pol and Madeline Sung. Returning many of its top players, the Lady Jeffs are eager to defend their NESCAC title and are reloaded for an impressive fall. The class of 2016 will also look to carve out roles for the squad. The women begin the fall season at MIT with ITA Championships from Sept. 28-30. Amherst then hosts Williams on Oct 6 and wraps up the fall season with the NEWITT tournament, as the Lady Jeffs face off against Mt. Holyoke and Smith College.